Education Min. and Jewish Agency Head meet with students from around the world to promote ties between Israeli and Diaspora Jewish students. Chairman of the Executive of The Jewish Agency for Israel Natan Sharansky and Israeli Minister of Education and Diaspora Affairs Naftali Bennett spoke this week to Jewish children and teenagers on three continents in celebration of the new government-established Week of Strengthening the Connection to Diaspora Jewry. The conversation, which took place in The Jewish Agency’s situation room in Jerusalem via videoconference, centered on the connection between Israel and the Jewish world and involved students from five schools - Golda Ochs Academy in West Orange, New Jersey; the Arthur I. Meyer Jewish Academy in Palm Beach County, Florida; the Begin Interdisciplinary School in Safed (Tzfat), Israel; the Merchavim Regional School in Merchavim, Israel; and Ulpanat Noga in Beit Shemesh, Israel - as well as campers at a Bnei Akiva summer camp in South Africa, where it is currently summertime. The students are all connected to one another via The Jewish Agency’s Global School Twinning Network, which pairs Israeli schools with Jewish schools throughout the world. 650 schools are currently connected through the program, touching the lives of tens of thousands of Jewish young people on six continents every year. Jewish Agency Chairman Natan Sharansky said: “Israel and the Jewish world are attached and dependent on one another in the two great Jewish battles of our generation: the battle against assimilation for the sake of the Jewish people’s future, and the battle against delegitimization for the sake of the State of Israel’s future. We will prevail only if we work together, in full cooperation, and it is important that that conversation start amongst schoolchildren." 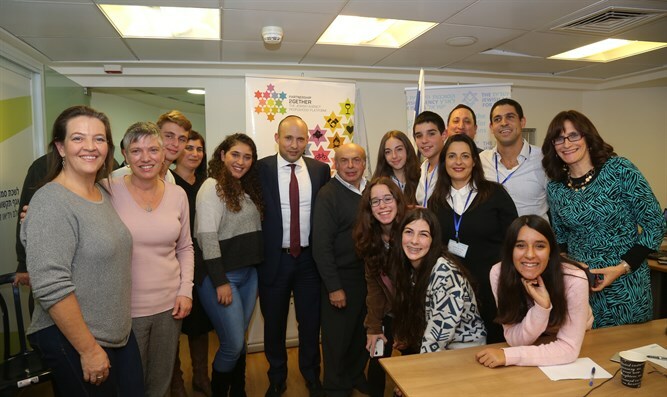 Minister Naftali Bennett said: “I am pleased to see the success of The Jewish Agency’s Global School Twinning Network, which strengthens connections between Israel and Diaspora Jewry. I am Minister of Education for Israeli students, but as Minister of Diaspora Affairs I also feel a sense of responsibility for the education of Jewish students around the world."